A lot of things will soon be happening automatically and without active consumer involvement, just like in Beatrice’s life (see Box 1). What Beatrice notices is just the tip of the iceberg. Underneath the surface, dozens of applications are communicating and interacting with each other. As a result, the world of the future is much more about integrating your products within this overall network and enabling them to interact with other devices than it is about marketing to consumers. 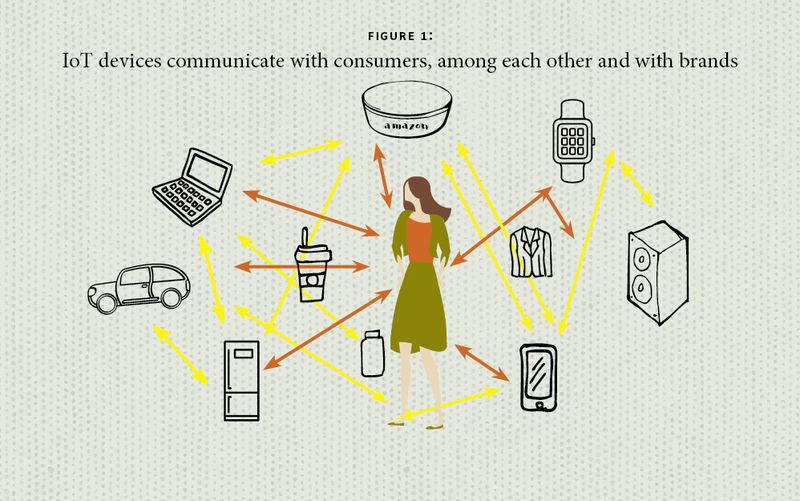 In the world of the Internet of Things (IoT), the endpoints and persons in charge are still the consumers, but they are at the center of a complex network of device-based interactions (Figure 1). Therefore, in order for a brand to succeed in this complex environment, it needs to work within this network and make sure that its messages are the ones that filter all the way through and ultimately reach the consumer. Beatrice Lee is a twentysomething, young professional fashion designer. She wakes up one morning and the first thing she does is ask Amazon’s Alexa about the weather for the day. Alexa tells her that it will be sunny with a chance of rain and also lets her know that her favorite blouse is ready at the dry cleaner, according to an email received during the night. Alexa then goes right into playing a morning news broadcast followed by Beatrice’s favorite podcast, which Alexa had learned about from monitoring the usage of her Google Pixel during the day. As Beatrice is getting dressed and ready for the day, she walks by her Samsung refrigerator. It signals an order of groceries all ready to send out after her approval – based on her past ordering patterns. She approves the order and heads toward the door for her morning workout. As she passes through the door, her Nest doorbell displays a notification on her Apple watch, reminding her to grab an umbrella before heading out. On the way to the gym, her Android Auto-enabled Ford CMAX pings to remind her of a voucher for a free beverage at Starbucks that she could pick up on the way and that she should not to forget her blouse at the dry cleaner. We can view the IoT as a network whose components are IoT devices and messages (see Box 2). Only a few devices like Amazon’s Alexa, Apple’s watch or Google’s Pixel have the ability to actually communicate directly with consumers, while the other devices in this network can only communicate with other devices. Therefore, the goal for a brand entering into this complex network is to provide the right messages to the right devices so that meaningful messages ultimately reach the consumer. What actually makes it to the consumer’s attention is not necessarily obvious from the beginning. In Beatrice’s case, her car cannot remind her about a free coffee without the Starbucks app on her phone, and without the GPS located in her car knowing where she is and where she is going, the Starbucks app would not know that she was going to pass by a Starbucks. A brand alone cannot provide the messaging necessary for the consumer. Brands need to work together with other apps and devices to create an emergent experience that a consumer such as Beatrice enjoys. Moreover, any experience emerging from an IoT network will create feedback that affects the decisions of individual brands. Grocery brands might become aware that people are regularly using their Samsung refrigerator to order food. As a result, more grocery stores may produce online endpoints for IoT, allowing these devices to order from them automatically. Also, more packaged food producers may start creating RFID-enabled products so that the refrigerator can monitor these food items. Such decisions, in turn, may inspire other additions to the IoT such as a smartphone app that monitors consumers’ caloric intake based on these RFID tags. How can managers make sense of what’s going on in the Internet of Things? How do they decide what to invest in? How do they choose which new products to develop and how to enable IoT on older products? A framework that can help facilitate answering these questions is the theory of complex systems. This theory has been used to understand systems as diverse as ant colonies, residential location decisions, the immune system and the creation of firms. 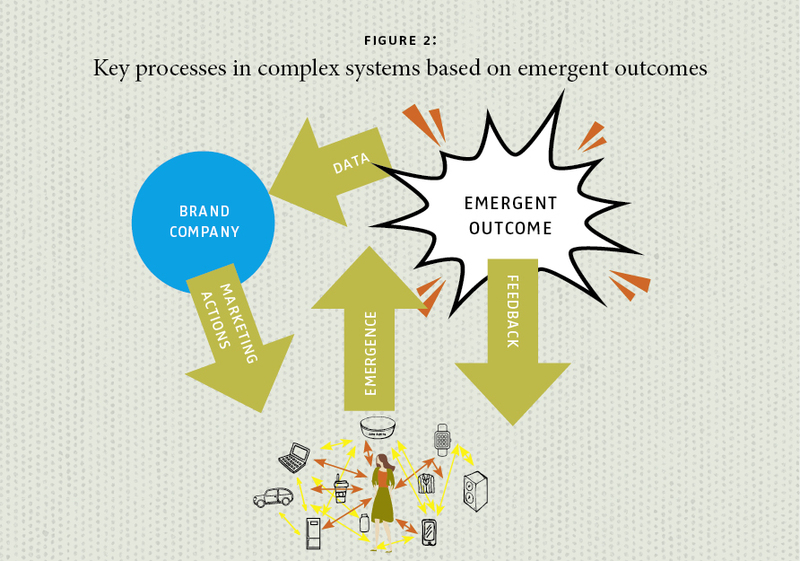 In fact, in an area very related to IoT, in 2003, Proctor and Gamble used a complex systems perspective to create an agent-based model. That model helped to optimize their supply chain, resulting in an estimated $300 million reduction in costs of operation. Emergence: The network creates patterns of behavior that emerge through its interactions. The outcomes are different from anything any individual element could have produced by itself and are more than the mere sum of all of the parts. Feedback: The emergent pattern of behavior generates effects and feedback on individual components. Such feedback can be used to learn about system dynamics and to guide a system towards a desired state (see Figure 2). So, what does the theory of complex systems tell us to expect from IoT? There are a number of lessons that seem readily applicable. Trying to control a system that has so many moving parts is a futile effort. Research into complex systems has shown again and again that it is hard to force them into a particular state. Taxi companies found this out when they tried to control the system of urban transportation by controlling who could provide taxi services within a town. Uber and Lyft showed them that this control was useless. However, if the taxi companies had been forward-looking and had realized the advantages of app-based ridesharing, they could have offered an Uber-like app earlier and potentially avoided this disruptive competition. Since IoT-enabled devices inherently must be able to communicate with other applications in the system, their designers need to make sure that they can only send and receive valid messages and consider the ramifications of those messages on the rest of the system. If security is underestimated, the whole system and the consumers are put at risk. As an example, Chrysler, like many car manufacturers, enabled their Jeep Cherokees to communicate with the Internet. They designed their Uconnect system for entertainment, navigation, and a few car controls and the car itself as an integral part of the IoT. However, their systems were hacked, and it turned out that the entire car could be controlled remotely. The Uconnect system could not control the car’s engine and wheels directly, but hackers were able to send signals to kill the engine, disable the brakes and track the car using GPS. They did this by first controlling the Uconnect system and, since the Uconnect entertainment system is linked with another network that controls the car’s engine and wheels, they could send “spoofed” messages that could stop the car. A single component of a complex system has very little power on its own, and the components around it serve as gatekeepers to other elements. This is especially important within the realm of IoT because the goal is often to get a message or piece of information to a real human consumer. In order to get there, the product must communicate with a host of other devices. For instance, Amazon’s Alexa is becoming increasingly popular, and one of the most widely used features is voice-searching and ordering of products. So far, Amazon vastly limits the number of different brands that can be bought through Alexa. As a result, smaller brands can hardly be considered within the IoT if they do not provide their own solutions. Amazon now encourages brands to create branded apps for Alexa, which they call “skills.” For instance, Unilever created a skill called Cleanipedia that teaches consumers how to solve cleaning problems and suggests Unilever products. By working with this powerful gatekeeper, Unilever has developed a way to still reach consumers that rely on Alexa. One of the greatest qualities of IoT is that it is creating massive amounts of data. We learn what consumers are doing, how they are doing it and how the other components of the IoT are working with our own products and apps. It is important to examine this data and to understand the usage of IoT-enabled products and their interaction with other nodes in this complex network. For instance, one of the first IoT devices, which even predates the use of the term IoT, was a camera “trained” on a coffee pot at the University of Cambridge. It enabled people who worked in the building to know when coffee was available. No one had ever intended for these cameras to be used for monitoring daily activities. Nevertheless, this development inspired the first webcams that are now in use throughout the world to allow people to monitor what is going on in other locations. The data about how consumers are using devices helps companies to get a better idea of what people actually expect from IoT-enabled devices and to develop better solutions for them to accomplish these goals. Holland, J. H. (2000): Emergence: From chaos to order. OUP Oxford. Mitchell, M. (2009): Complexity: A guided tour. Oxford University Press. Rand, W. and Rust, R. T. (2011): “Agent-based modeling in marketing: Guidelines for rigor”, International Journal of Research in Marketing, Vol. 28 (3), 181-193. Sterman, J. D. (2000): Business dynamics: systems thinking and modeling for a complex world (No. HD30. 2 S7835 2000). Internet of Things – Will Humans be Replaced or Augmented?